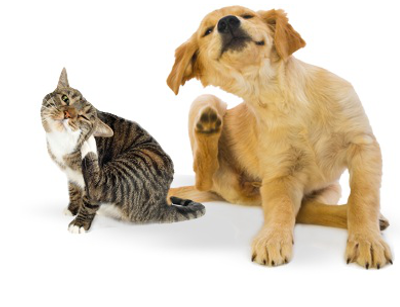 Fleas are a common household problem, particularly with those who have pets. Unfortunately, some discover flea infestations even when they don’t have pets; due to previous owners of the property who kept pets never taking full responsibility. Other hairy animals who can become victims of fleas include; rabbits, squirrels, foxes, rats and mice. Fleas are wingless insects, external parasites that have survived from the mid Jurassic era with over 2,000 species worldwide. They are usually reddy-brown and about 2mm long. They are very difficult to spot on rough textured materials and surfaces with the naked eye. They have evolved tube like mouthparts, which allow them to pierce into the skin and consume the blood of mammals. They are incredible jumpers, reaching the height of about 18cm jumping upward and about 34cm if jumping sideways. Fleabites are not painful, however, they can result in a very uncomfortable itch or rash. Pets end up in a lot of discomfort by constantly scratching from irritation, biting their fur or rubbing their coats against different surfaces. If a female flea feeds on blood for 10-12 hours straight then it can lay viable eggs. Flea eggs are white ovals at only 0.5mm long. These eggs hatch, eat the dead ones and the faeces, turn into larvae, pupae, hatch, feed, lay eggs then die. Flea eggs are commonly forgotten about as we mistakenly assume that one treatment is enough to eradicate the problem. The cycle is unbreakable until professional treatment is put into practise. Do I need to throw anything away? Do not make this mistake; throwing items away would be an unnecessary expense. Anything that gets replaced will be a fresh new surface for them to jump about on. We understand the emotional distress of having fleas in your home. Call City Serve Pest Control to permanently remove this infestation with our special flea control treatment and for that real piece of mind.